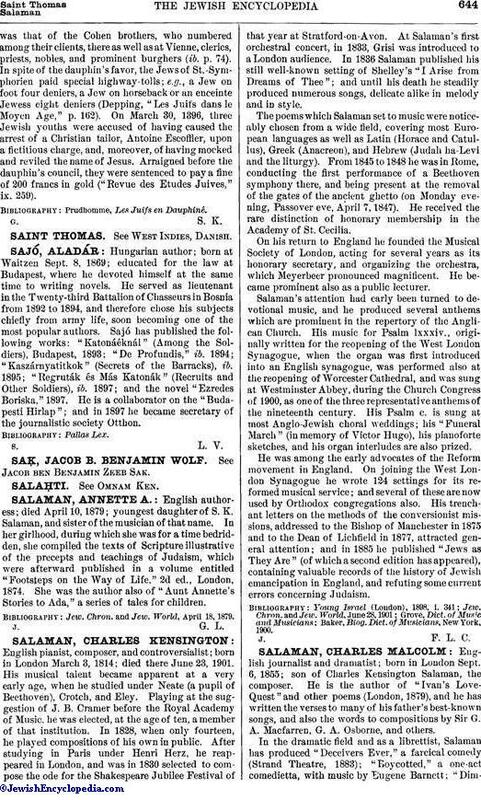 English authoress; died April 10, 1879; youngest daughter of S. K. Salaman, and sister of the musician of that name. In her girlhood, during which she was for a time bedridden, she compiled the texts of Scripture illustrative of the precepts and teachings of Judaism, which were afterward published in a volume entitled "Footsteps on the Way of Life," 2d ed., London, 1874. She was the author also of "Aunt Annette's Stories to Ada," a series of tales for children. Jew. Chron. and Jew. World, April 18, 1879.